Fish is such a versatile ingredient, and this recipe helps show yet another way it can be used to add variety to your diet. This Brazilian-inspired dish shows how fish can be combined with some non-traditional additions while allowing you the convenience of a meal that’s quick and simple to prepare. The spices in this dish give it a smoky and sweet flavor, one that is reminiscent of an outdoor grilled meal, but without all the hassle. The use of white fish in this meal allows you to reap the many health benefits of this protein, which include nutrients like Omega-3 fatty acids and selenium. While there is a lot of debate regarding the environmental impacts of eating fish, you can do your part by choosing fish harvested through sustainable practices when you make purchasing decisions. This is a great way to ensure you are able to incorporate this Paleo staple while still making environmentally-sound consumer choices. 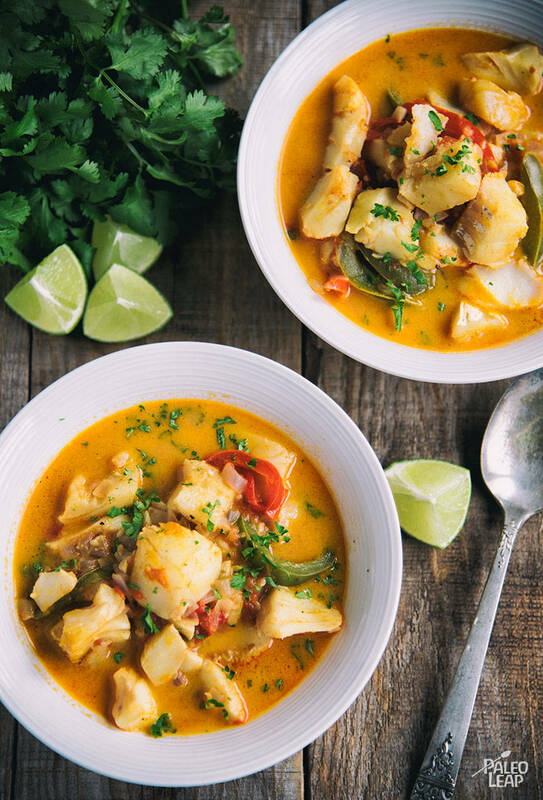 This fish stew recipe is great for dinner – although it may seem on the lighter side, the inclusion of coconut milk and stock adds a bit of unexpected heartiness. Still, for a complete meal, consider serving this with a flavorful side dish that complements the spicy-sweet flavors of the stew. Heavier, root vegetable sides are a great option for this. The inclusion of cayenne in this dish will add a bit of heat – if you prefer a milder version, cut the cayenne used by half. Add the fish and toss until well covered. Heat some cooking fat (about 1 tbsp.) in a large skillet over medium-high heat. Add the garlic, onion, and bell pepper; cook until soft (about 2 to 3 minutes). Pour in the fish/vegetable stock and coconut milk; give everything a good stir. Whisk in the cumin, paprika, and cayenne. Bring the soup to a boil, then lower the heat to a simmer and add the fish to the broth. Cover the stew and cook until fish breaks apart, about 12 to 15 minutes. Serve the stew with fresh lime wedges.